Spicy pan-seared cauliflower takes center stage when wrapped in corn tortillas with crisp cabbage, creamy avocado, and refried beans. Though simple in concept, the contrasting flavors and textures dazzle when put together. Depart from tradition to enjoy a bold new approach to preparing those unassuming white florets. You will love the blend of hot paprika and cayenne pepper with the tart zing of lime juice. Best part is, these tacos are ready to eat in under half an hour! While the cabbage brings a nice texture to these tacos, romaine lettuce also works well in this recipe. 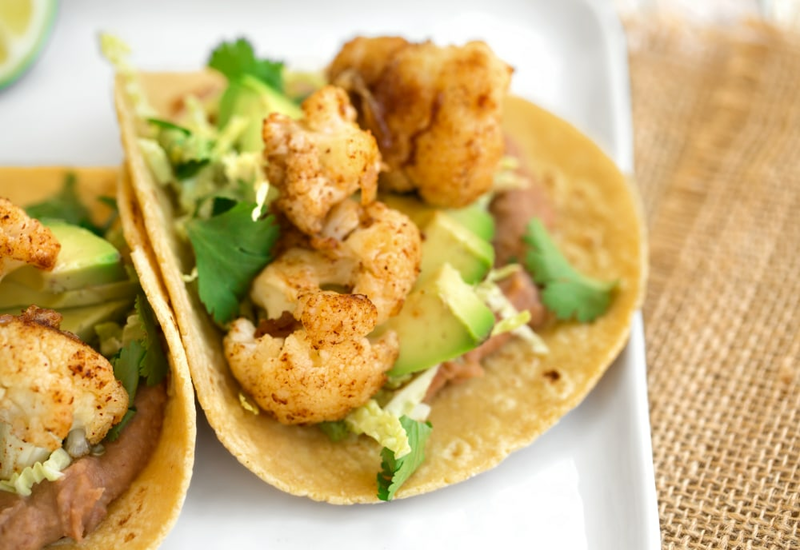 This recipe is a vegan twist on Taco Tuesday! Per Serving: 442 calories; 19g fat; 61.0g carbohydrates; 16g protein; 0mg cholesterol; 751mg sodium. Delicious tacos for meatless Mondays or Taco Tuesdays! I also haven't had refried beans in forever, but they made a comeback with these tacos. This is definitely a new favorite! I don't eat many vegan meals but this is one that I love. The paprika and cayenne seasonings tasted great on the cauliflower. These are perfect for Taco night. I can't wait to make them again. Delicious! Ok! What a quick meal, can't believe it's only 1 pan! This was really good, I put a lid on the cauliflower for a few minutes to soften it a bit more, but the flavor was really good! I am on of those people who thinks cilantro tastes like soap so I left that out. I also used homemade refried beans instead of canned. I will be making this again. Just when I thought I was over cauliflower, I try this recipe and it changes my life! Instead of cayenne pepper I used a Cajun spice seasoning mixture and it was so delicious. The cabbage was perfect, and I added guacamole (the taqueria guacamole recipe on this website). Perfect for Taco Tuesday. Made this recipe with black refried beans. Super yummy! Perfect for meatless Monday or taco Tuesday!